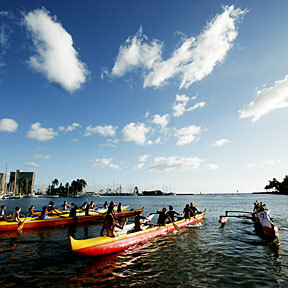 Three Punahou crews, at left, and one Maryknoll crew, at right, got ready yesterday for outrigger canoe practice off Magic Island. Seven cast members have been cited by Honolulu police. Some find the event instructive, while others find it meaningless. 12 Days of Christmas: A dozen days of gift ideas. But the suspended guard may not play in Saturday's game. Oahu malls say holiday sales appear to be growing strong this year. A survey of Honolulu police officers is highly critical of Chief Boisse Correa's leadership.